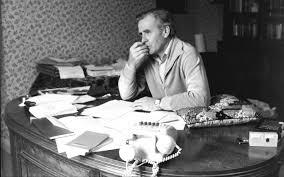 My father read John le Carré novels. They filled his shelves. I never thought much about them or read one until I began writing. The Spy Who Came in from the Cold, Smiley's people, Tinker, Tailor, Soldier, Spy. Blew my eyes open. Can't say I didn't find them complicated but amazing in his descriptions of places, characters, telling details and locations. And touching because as a reader I cared about these characters, felt them, experienced the emotions, those nuanced details that brought alive a 'safe house' near the London docks operated by the Circus, the apartment of an exiled Russian factory worker in Paris. 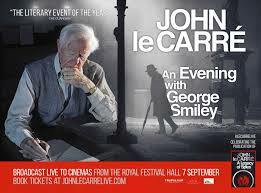 So aeons ago when le Carré still toured for his books, my father wanted to see him speak at a huge venue next to our City Hall. Before I could buy tickets he begged out. Now I realise that while his spirit wanted to, his body and mind wouldn't cooperate, he was in the beginnings of Alzheimers. But I attended and it was amazing. Not only hearing a writer talk - my first time listening to an author and what an author and speaker! - but of his process, his past in the espionage world and the poignant stories of his father, a con man and criminal, who he had to bail out repeatedly. Maybe it eased his own way into the secret world and maintaining a facade. Then next day I called the venue to see if I could buy a tape (before podcasts) for my father. Oh you know le Carré just called me before you did, said the woman in the office. Really? Why? He wanted to write and thank the techs for their help and asked for their names. Hadn't there just been a podium, microphone and well lit stage? Yet such attention to detail. Thoughtful. But maybe that came from his training as a runner of 'joes'. Still, what a thing to do. He writes in pen, and his wife types up his work. He said the Bodleian library practically threw up their hands when they asked him to donate his papers. Boxes and boxes and boxes worth. To me, and whether you agree or not, or a fan or not, he's been a voice through his work and layered characters. He's more than a national UK treasure but a living world treasure. 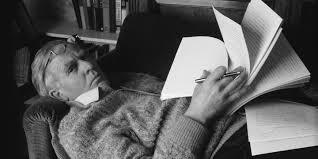 Solzhenitsyn, Gunter Grass and many who spoke to our conscience are gone now. Who else has witnessed the Berlin Wall going up and later when it came it down and wrote about those times in ways that brought the readers as witnesses. How Smiley's nemesis, the Russian Karla had one weak spot - love for his daughter - that's a universality one can relate to. How the world he paints isn't black or white but shades of grey. He's seen the world through many decades of war and the Cold war, met the players, gone behind the lines, wrote a spy story while employed at MI5, took on big Pharma before it became popular, and for an eighty plus year old man speaks lucidly and insightfully how what's happening now feels like he remembers in the rise of facism in the 30's. I'd recommend hearing le Carré (David Cornwell) in his own voice while you still can. 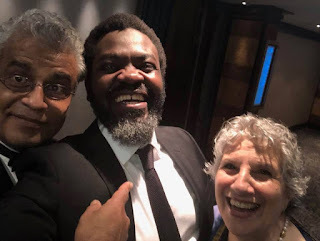 I am in London, where I travelled for the CWA banquet and a chance to meet up with some friends. 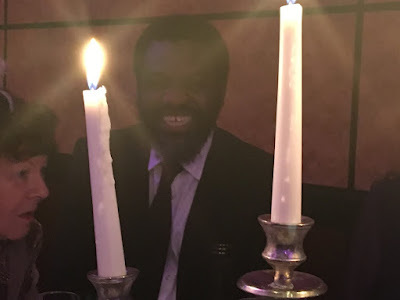 But the huge highlight of the trip was attending the CWA Dagger awards ceremony with Leye Adenle, one of Sunshine Noir's two (out of the six!!!) 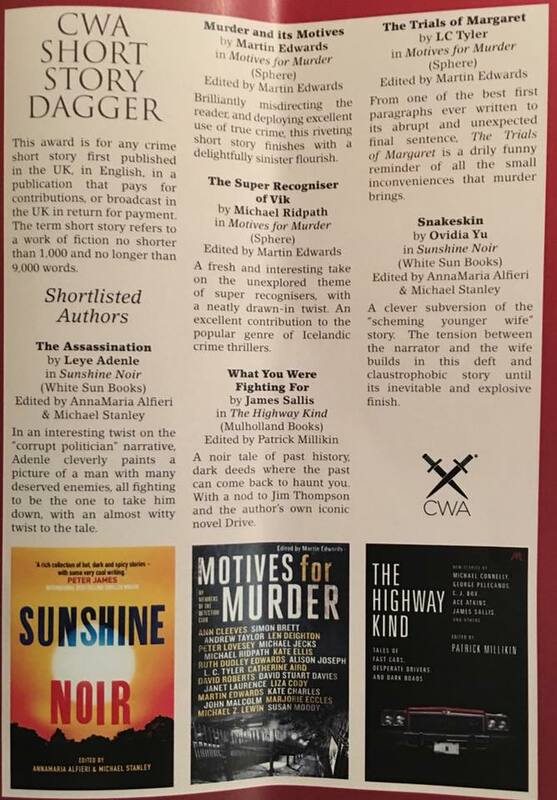 nominees for best short story. Stan warned us that the affair was very posh, so Leye and I did our best to make a good impression. The tables were set with place cards that put us pals opposite each other. When I picked up my phone to snap this picture through the candles.. I found Leye taking the same photo of me. 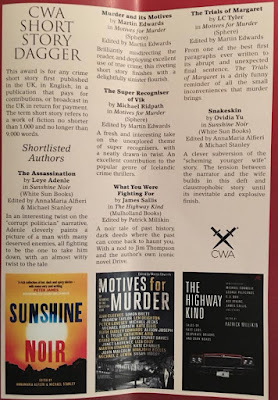 ...but I was encouraged to note that four of the six nominees were hot clime writers--two Italians and two Spaniards. that were at my disposal. 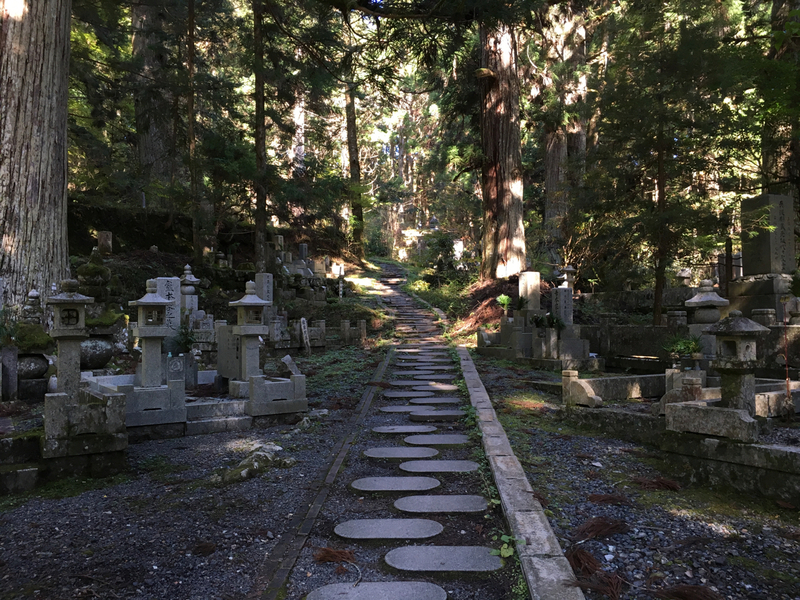 On both of my last two trips to Japan, I spent significant time beneath the towering ancient cedars of Okunoin - Japan's largest cemetery. 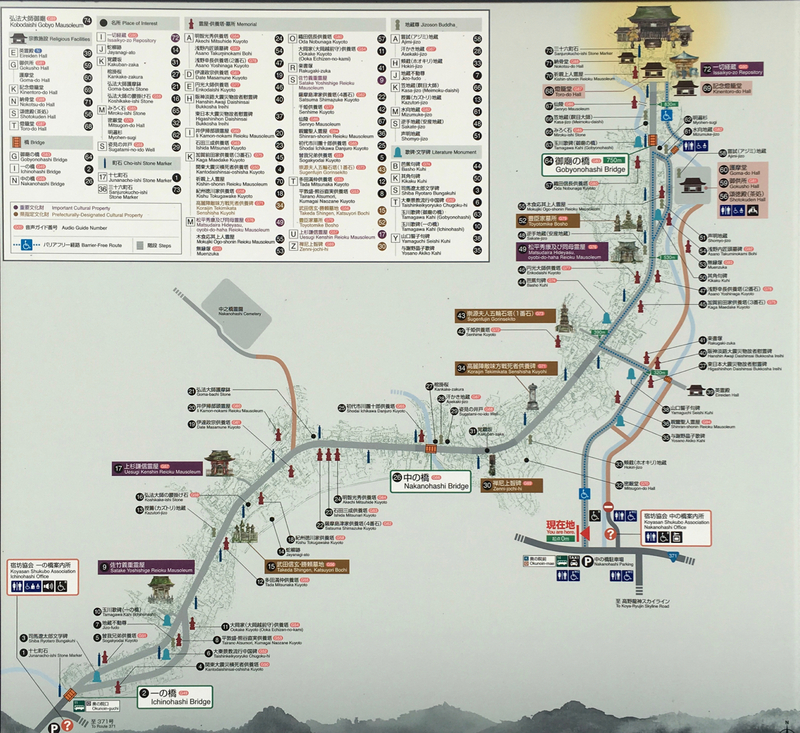 A map of Okunoin. Kobo Daishi's mausoleum is at the top, and the entrance at the bottom left. 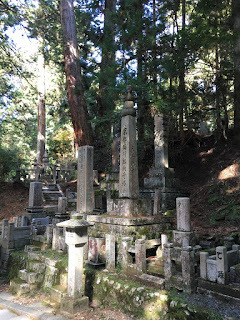 The cemetery stretches over a mile from end to end, and has over 200,000 graves--some of which serve as the spiritual grave sites for multiple people rather than just one. 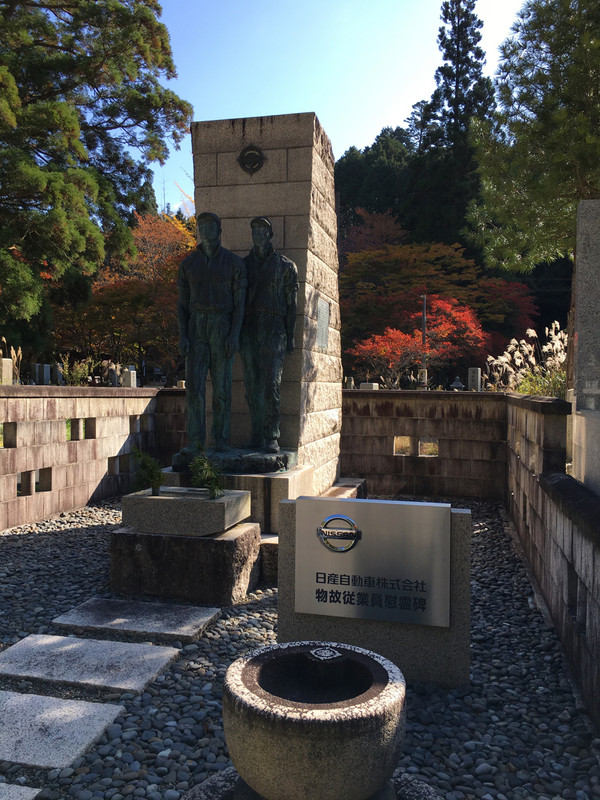 The Nissan Corporation tomb - erected on behalf of all employees, past and present. 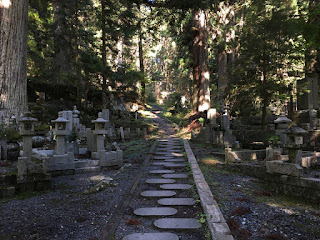 The cemetery begins at Ichi-no-hashi (the first bridge), where a paved path leads visitors into the cedar-lined path that runs through Okunoin from end to end. 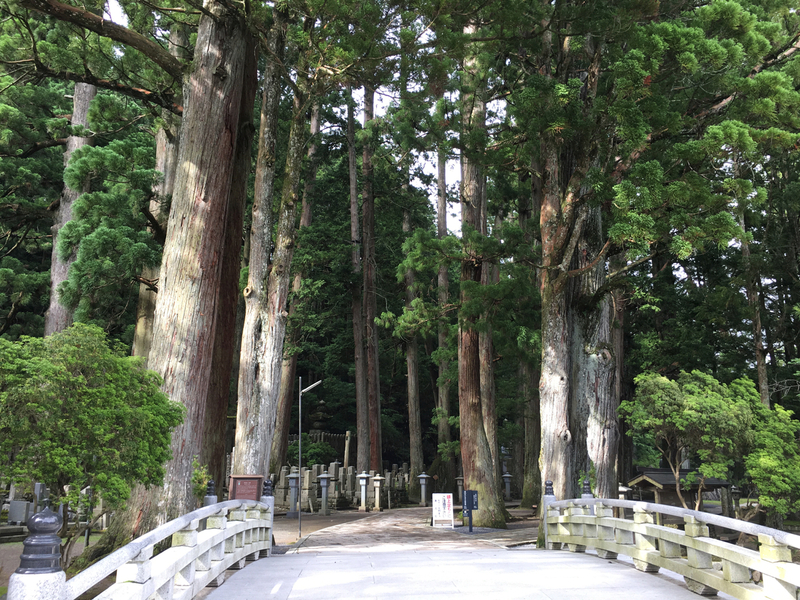 Visitors bow before crossing Ichi-no-hashi into Okunoin. 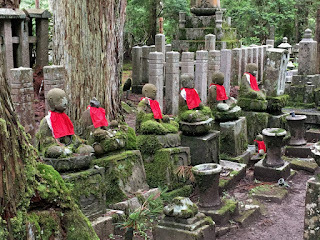 According to Shingon doctrine, anyone buried--in part or entirely--at Okunoin will return to life first at the time Miroku (the Buddha of the Future) returns to earth at the end of days. For that and other reasons, since the cemetery's founding in the 9th century, many adherents of the Shingon faith (and others -- anyone can be buried at Okunoin, if (s)he believes in the teachings of Kobo Daishi, Buddhist or not) have wanted to be buried on the mountain. 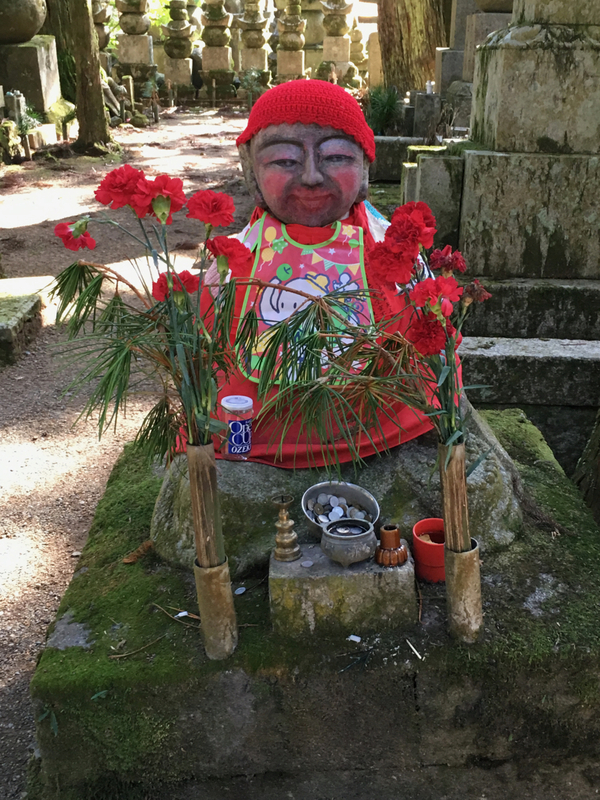 Kobo Daishi, the priest who brought Shingon Buddhism to Japan from China, is buried there too - though Shingon doctrine states he's actually still alive, in a state of eternal meditation that will continue until Miroku returns. You can't photograph Kobo Daishi's mausoleum, so here's a buddha for you instead. 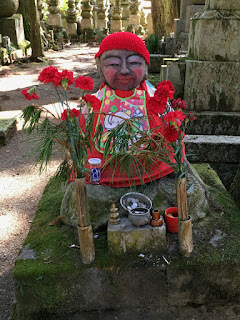 Visiting Okunoin, and seeing his mausoleum, is often referred to as "Visiting Kobo Daishi" - and he has many, many visitors. 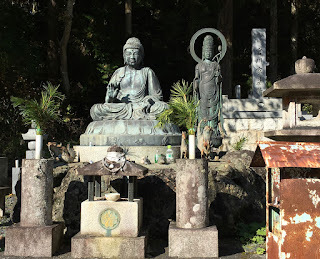 Okunoin is a popular tourist destination for Buddhists and non-Buddhists, Japanese people, and foreign visitors. 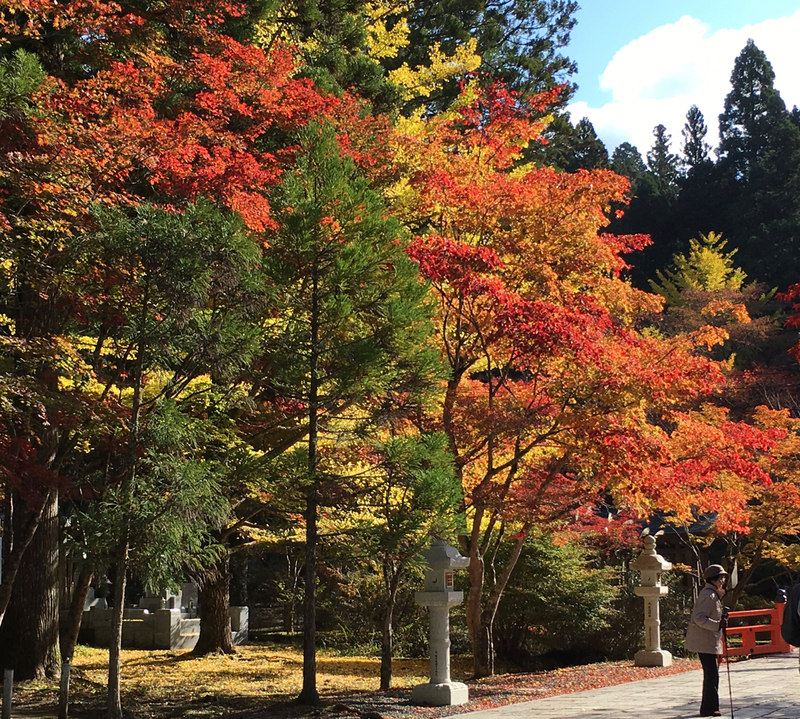 It doesn't hurt that the cemetery has glorious foliage displays each autumn, either. 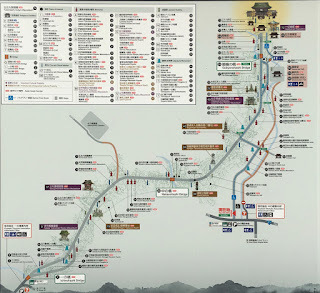 Many side paths branch off from the main one. 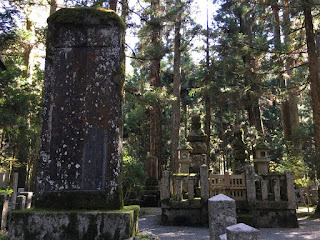 Many famous Japanese people are buried (or have mausoleums or monuments) there, including several shoguns and numerous daimyō (medieval warlords). 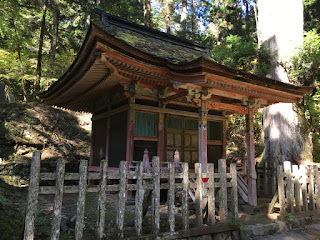 The mausoleum of Uesugi Kenshin, erected during the 16th century. Their monuments stand directly beside those of ordinary people, men and women whose names and achievements are now mostly lost to history. 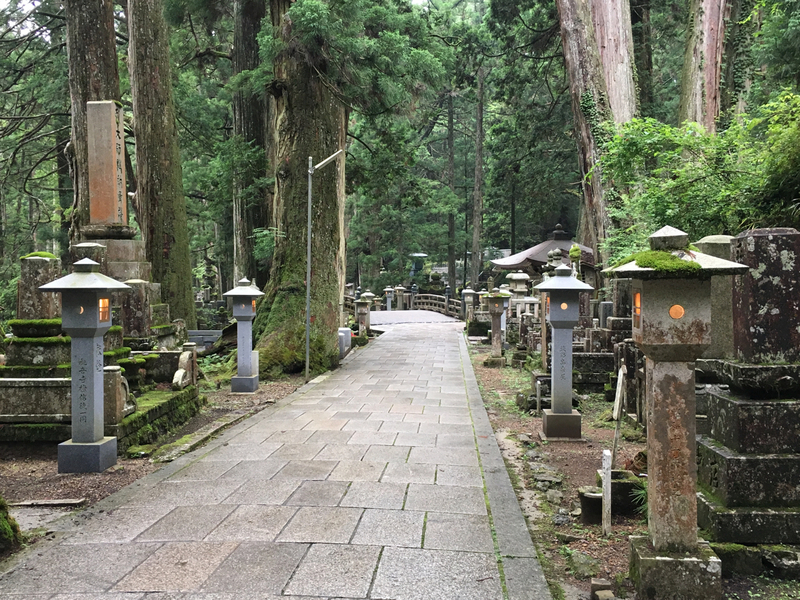 In all my travels, I have never been to a place as silently peaceful as Okunoin. The cedars rise to the sky like protective sentinels, guarding the dead who lie beneath. 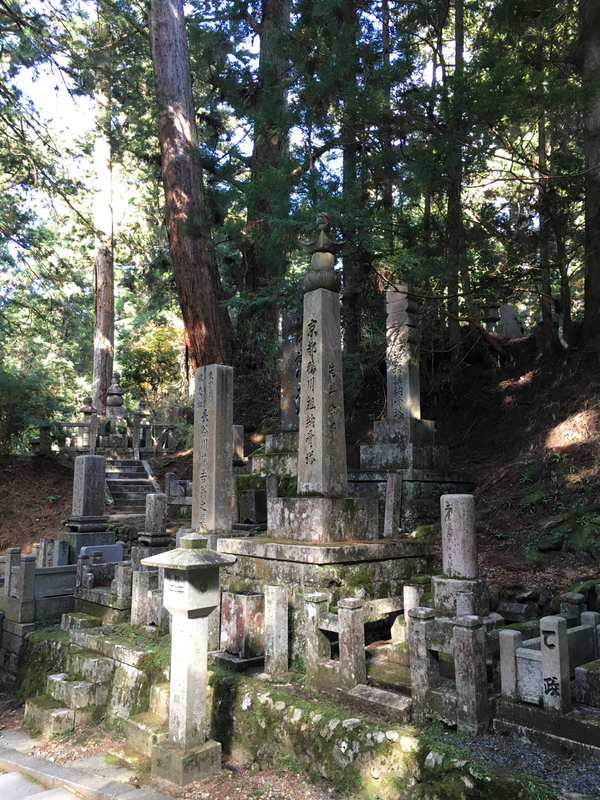 The graves don't ever seem to end. 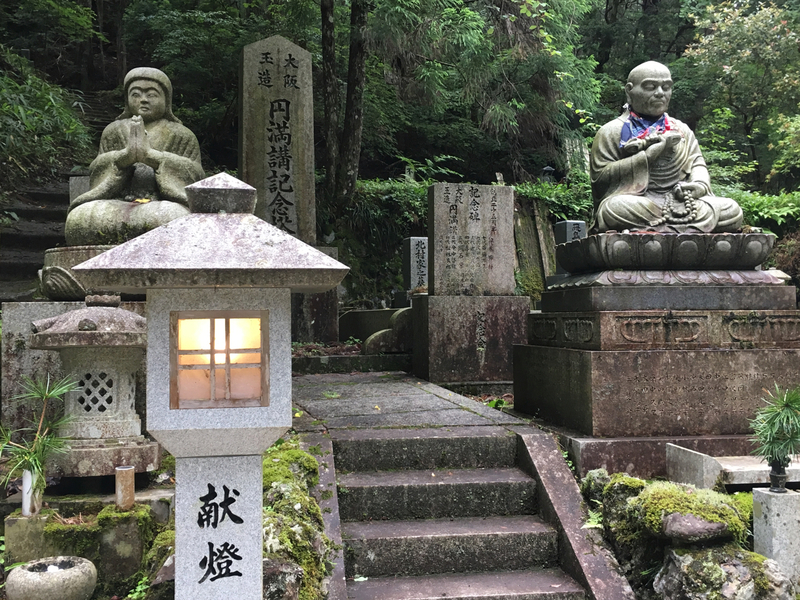 The well-tended graves and kerchiefed Buddha statues speak of a place where the dead may not be visible, but remain as loved and remembered as any living person could ever hope to be. 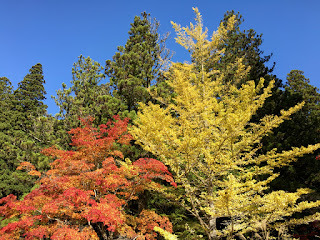 It is a place where even the most troubled, stressed-out heart can find peace, and where anyone with reverence for the spirit and the residents of the place is not only welcome, but invited to walk and think and be. It is a holy place, where real, lasting peace feels possible, tangible, and close. 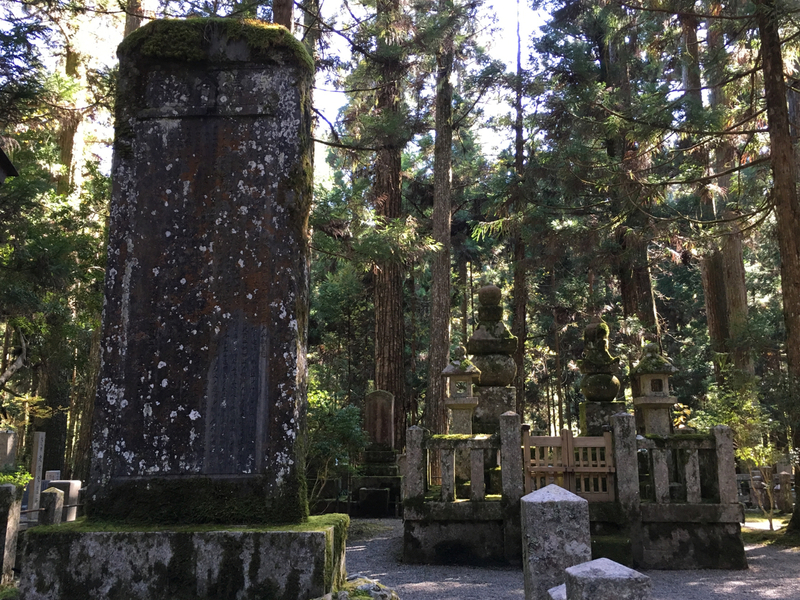 These photos don't do justice to its beauty, so I hope, if you ever have the chance, you'll go and visit Kobo Daishi beneath the trees. I can assure you, it will be a day well spent. Greece Created Democracy, But Did You Know It Also Saved It? 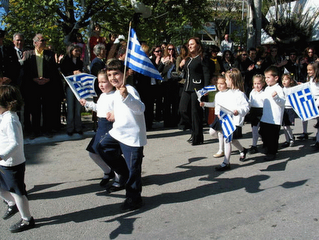 Today, October 28th, is a Greek national holiday; one of two publicly revered ones to be precise. 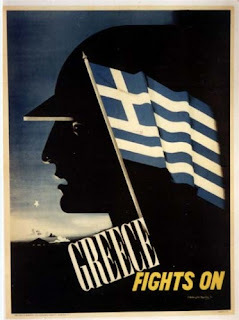 The other, March 25, commemorates the day in 1821 that Greece declared its Independence from the Ottoman Empire and fought until 1832 to obtain it. 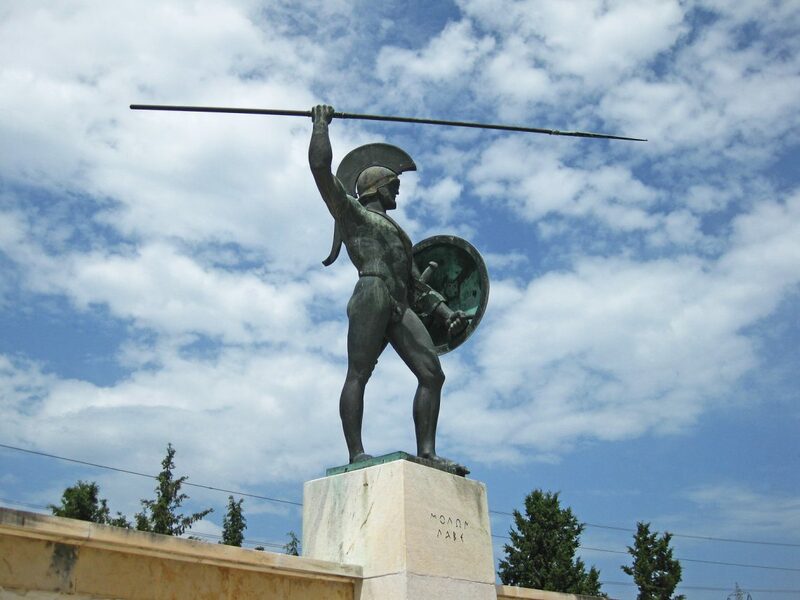 “Oxi,” together with two other words uttered nearly two and a half centuries earlier by Spartan King Leonidas in response to Persian king Xerxes’ demand that the Spartans surrender their weapons—“Molon Labe” (pronounced mo-lone laveh), meaning “come and take them”—is all you need to know to understand how Greeks react to adversity. 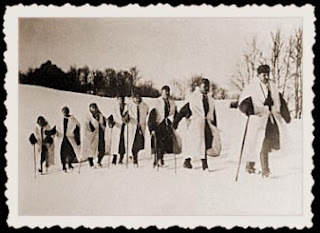 Those three words represent the essence of the Greek will, and permeate their attitudes toward virtually all things. Some say that leaves them open to manipulation by nationalistic political jingoists seeking to distract their attention from otherwise serious, underlying national problems and shortcomings…but what nation these days is free from that. 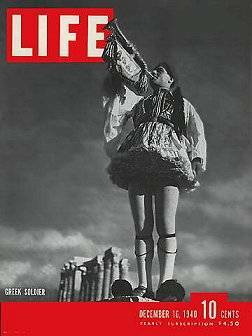 And here’s how Oxi Day came to pass. On the morning of August 15, 1940, the Greek navel vessel Elli was in the harbor of the Cycladic island of Tinos. 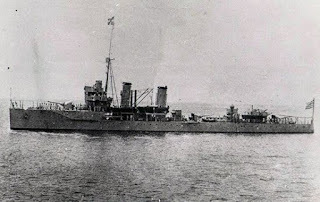 It was peacetime and the light cruiser was anchored to participate in a major Greek Orthodox holiday, The Dormition of the Theotokos (Assumption of the Virgin Mary). Without warning the Elle was torpedoed and sunk by a submarine, killing nine and wounding twenty-four. Although fragments of the torpedo clearly identified its source, the Greek government officially declared the nationality of the attacking submarine as “unknown.” The Greek government may have been reluctant to declare the attacker as Italy, and therefore immerse itself in war, but the people knew who was behind it. 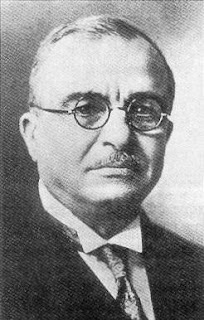 Two months later, around dawn on the morning of October 28, 1940, after a party at the German embassy in Athens, the Italian ambassador approached Greece’s Prime Minister Ioannis Metaxas and demanded that Greece surrender to the Axis powers or face immediate war with Italy. He offered Greece three hours to decide. 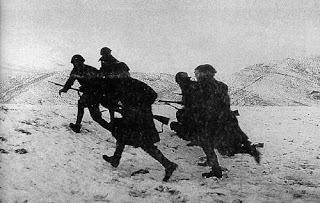 Italy had seven times the population of Greece, seven times the troops, ten times the firepower, and total air superiority. The Prime Minister’s response was simple: “Oxi.” And less than two hours later Italian troops stationed in Albania invaded Greece. Occupation of Greece was critical to Hitler’s plan for isolating British troops in North Africa. The Italians expected it to be a three-day war. They learned otherwise. Oxi became the battle cry of the Greek people. 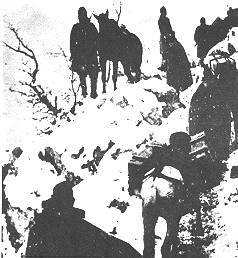 Within weeks the Italians were driven back into Albania, and repelled by the Greeks at every effort to occupy Greece. 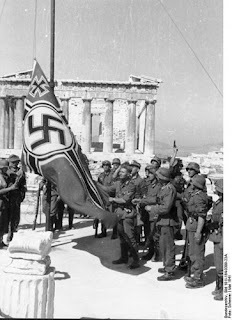 It became clear to Hitler that Italy was not up to the task and on April 6, 1941 Germany invaded Greece, but it took even the Nazis five weeks to succeed. 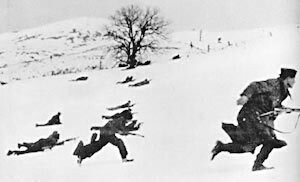 Greek resistance had thrown off Hitler’s plans to capture Russia before the winter of 1941. 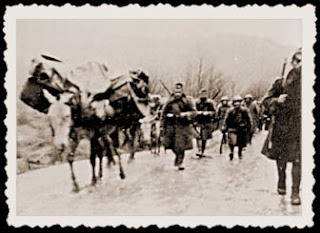 One million of Greece’s citizens (13% of the population) are estimated to have died from battle, starvation, resistance, reprisals and concentration camps. 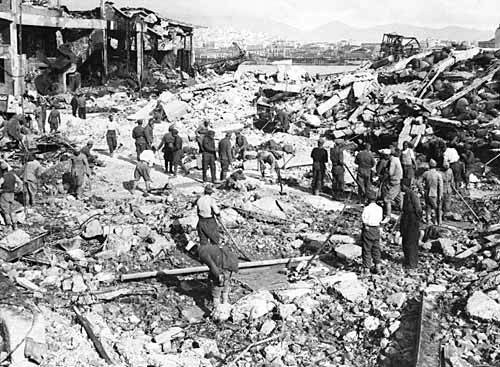 Greece’s infrastructure, economy and agriculture were destroyed. Greece’s gold, works of art, and treasures were plundered. Civil war followed and many emigrated. On a purely economic basis, it is estimated that in standing up to the Axis’ threats Greece was left in financial straits twice as bad as it finds itself in today… and its societal costs were inestimably worse. So today, as Greece struggles under different serious challenges, for those who seek to capture the extent of Greece’s national determination in a phrase, let me offer a quote from someone who understood as well as anyone on earth what the world once more owed to Greece: “Hence we will not say that Greeks fight like heroes, but Heroes fight like Greeks.” Winston Churchill. The End Of Things. And bobolinks? Today I am at the end of the world. 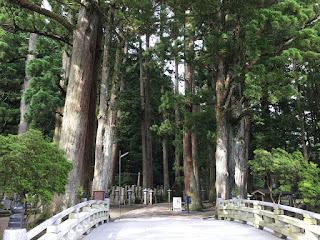 It is a place called after a prince who became a king and then became a potato. There is nobody here. It’s a half hour drive to buy a loaf of bread if you are lucky. It’s a full hour plus to be certain of the bread. And an internet signal that is slightly weaker than a distressed honey bee trying to toss a caber; a lot of activity achieving nothing. The roadways have been closed with giant boulders, all leaving one option at a junction, and that choice takes you right back to where you started. Entrance and exit barriers are all raised. The ticket offices are closed, the attractions lie dull and motionless. And silent. The long empty road runs to infinity in front and behind, a long streak of grey as far as the eye can see. There’s a triangular sign warning that the speed limit is 9 km an hour. Not 8. Not 10, but 9. Volleyball nets packed away, swings hang loose blowing slightly in the breeze. The flag is wrapped round the flagpole, the maple leaf will not see the light of day until there is some daylight to see but there is rebellion in the quiet yet tuneful chink chink chink of the metal clasps drumming on the flagpole with the rhythm of the wind. The music is gone but not forgotten. At the marina, there are sun bleached posters for pickleball and line dancing. Four oldies have been abandoned, overlooked on the checklist by their relatives and left behind. The buggies are parked at the side of the pontoon, on the pontoon itself sit the gang of four, in collapsing deck chairs, wrapped in warm blankets. I know that tomorrow there will be three, then two then one. It’s like watching the end of Beaches in slow motion. We have made friends with a black squirrel, a chipmunk – well we think hes a chipmunk but watching Alvin gave us no idea of scale- wee brown guys with two go faster white stripes? Alvin had led me to believe that his chipmunks were the size of small dogs, or large rabbits. Maybe they and these ones are stunted by the lack of ....everything. We are also friends with a small green frog we meet every morning as we walk the streets looking at the empty houses, fire pits covered over, buggies cling filmed in blue tarpaulin, chairs tied onto the verandah, windows closed, blinds down nobody at home. We are intrigued by the ancient hearse on the front lawn, and by a stuffed white Alsation stuffed on the back of a sofa, waiting. There are a few folk hanging around, they are either inflatable or have pumpkin heads and rags for clothes and are looking a bit weatherbeaten. I don’t think they are going to last. The end of the month will be it. I am looking for a bobolink. Having no internet, I have no idea what it is but I am determined to find one. He sounds fun. The waves though never cease to pound the concrete beach. Yesterday I found a dance floor. Deep in the vegetation my feet realised they were on Terrazzo, the black and white tiles are now shades of grey but still easily seen. There once was a hotel here, over a million visitors in the hundred years the building occupied this site beside the lake. A small placard has a couple of pictures and the interesting snippet that the ladies used to walk to promenade on their way down to dinner, wearing the latest fashions. Spinsters ( not ladies obviously) would sit and read books while the young men played jazz and cards, never the twain met. They also had a three hole golf course. I wonder what they did to cope with the excitement. This morning, the sun is shining. The dream catchers lie still but it has a sense of expectation. I wonder what the dreamcatcher is hoping for. The big one that hangs from the wooden roof of a house on Elm Street looks busy. I bet who carved that street name on the tree was having a laugh. We are on a pull through site, that suggests that we are expected to pull through. I think we are at the end of the world while at the end of the world if you see what I mean, both physically and chronologically. There are no pictures, The hard working internet bee cannot cope. But with no internet and no human interaction I am writing. And I am reading. I am reading books by Antti Tuomienen. I think I might have read too many. I used to be Scottish. I am now dystopian. Caro Ramsay 27 10 2017. Even that date. It's too much. Bouchercon was great fun (as it always is), and I had a super panel. 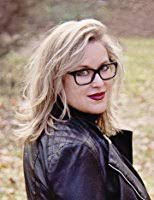 In the first place it was on a topic that really interests me—how mystery and thriller authors go about writing collaboratively—and second the authors on the panel are all award winning, New York Times bestselling authors, and, equally important, they are very interesting and experienced writers. I was the moderator, so I could find out all the things I’ve always wanted to know from them. 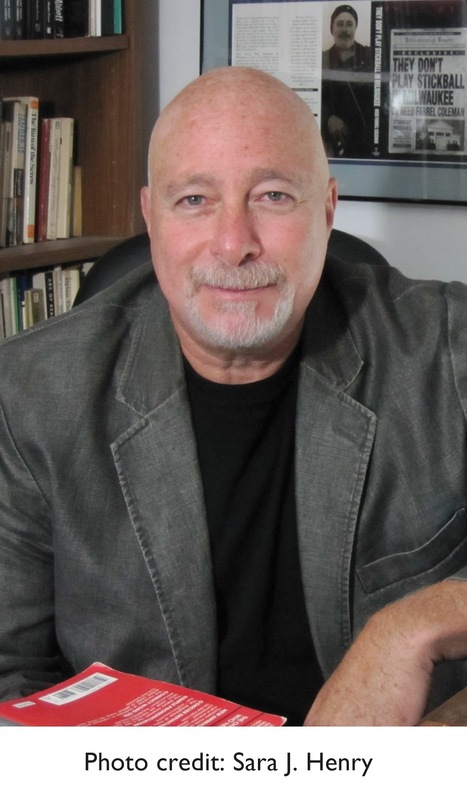 Reed Farrel Coleman, who continues the enormously popular Robert B Parker Jesse Stone series. Reed has just pocketed his fourth Shamus award and has won just about everything else going except the Edgar—and he’s been a finalist for that four times. 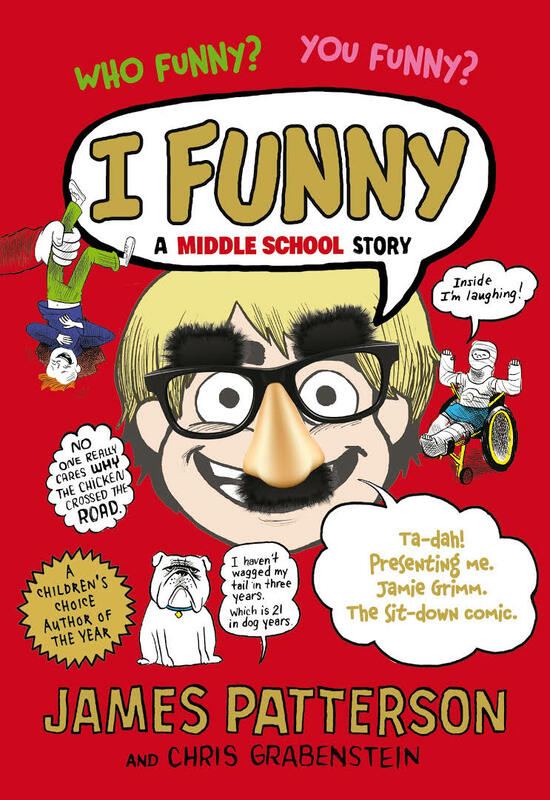 Chris Grabenstein writes witty mysteries on his own, and has won the Anthony, Agatha and Sid Feischman humor awards. 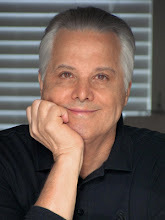 He also produces a prolific series of wildly successful books for young readers with James Patterson. He was this year’s Bouchercon4kids guest of honor. Charles and Caroline Todd write the popular Inspector Ian Rutledge and Bess Crawford mysteries set at the time of the First World War. They’ve won the Barry, Agatha, McCavity, and Mary Higgins Clark awards, and been short listed for the Edgar. 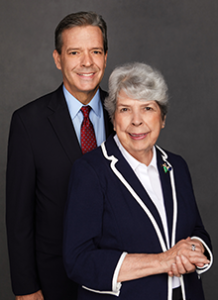 Charles and Caroline kindly stepped in for Max and Barbara Collins who had to drop out because of some medical issues shortly before the convention. 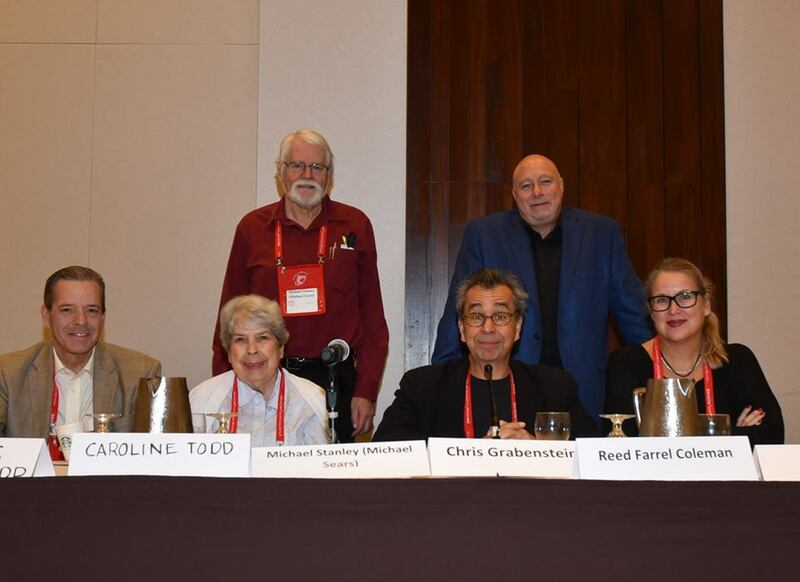 So you can see why it was a dream panel assignment for me; not only did I have a group of great authors, but their work spanned the whole spectrum of collaboration. I started off by asking each of them how the collaboration had started for them, and how it worked. 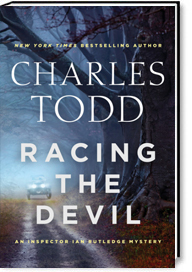 Reed took over the Jesse Stone series from another author, who parted ways with Robert B Parker's estate. He read all the previous books, trying to get himself into RBP's style. Then he got some really good advice from a friend who is a great Elvis fan. The friend has seen all the films, heard all the records, seen all the Elvis impersonators. The advice was simply this: all the Elvis impersonators were just that-they could never be Elvis. Reed took the advice to heart, found his own style consistent with the series, and has just launched the fourth book. It seems to work. 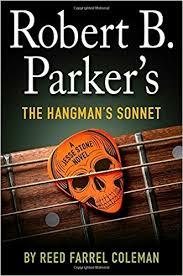 The Hangman's Sonnet started right up the New York Times best seller list. Reed speculated that a writing partnership has to have a boss (at least if both authors are still alive), and JT confirmed that Catherine was the boss. Her agent was approached by Catherine’s, and so she flew out to Catherine’s home to discuss a collaboration. It went well from the start, but Catherine is the big name, so she has to be happy with the style, plot and writing. 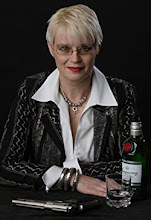 JT’s own books are more in the police procedural space, and so she enjoys writing the James Bond style thrillers. 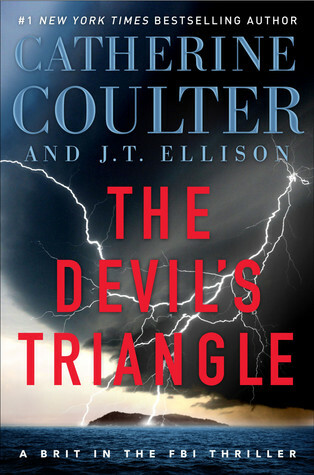 Thrillers give a freedom from the more constrained murder mystery. Chris confirmed that ‘Jim’ Patterson was the boss. They went back a long way because Jim was Chris’s first boss at an advertising agency. When he approached Chris many years later about a collaboration on books for kids, Chris jumped at it. Chris gave us a very different view from the rather snobbish one of Patterson having a slave pen of writers who do all the work and then have their names dropped off the books. Patterson is incredibly hard working and Chris estimates that he does more than half the work on the collaborative effort. 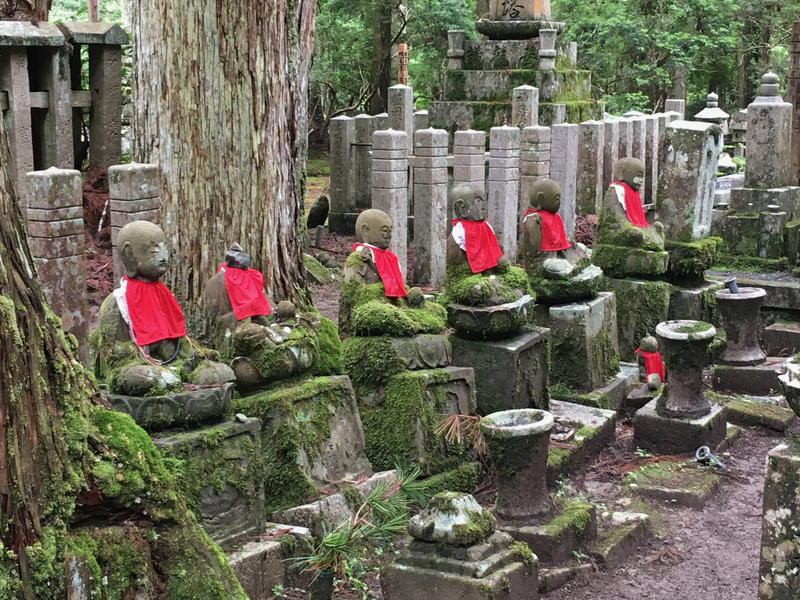 He works on eight books simultaneously each month. His office has eight desks each with the work for one of the projects. Chris often wakes to phone messages about their latest book. Overall, a very enjoyable experience, he says. Charles and Caroline told us the history of their collaboration. Both shared an interest in history, and enjoyed visiting England and the period of the early nineteen hundreds. Caroline said she chose Charles by default; none of the others in her family wanted to write with her. Charles just smiled and nodded. Their first idea came from a true case of a soldier whose body had been found where it was unexpected, and no one had really determined what the real story was. Speculating about that case gave them ideas for their first Rutledge book, A Test of Wills. Caroline once told me that they were unsure of who the murderer was right up to the last few chapters. That's serious pantsing! They write and research together - pretty much as we do. When things seem to one of them to be going offtrack, their solution is to work out what is best for the character. 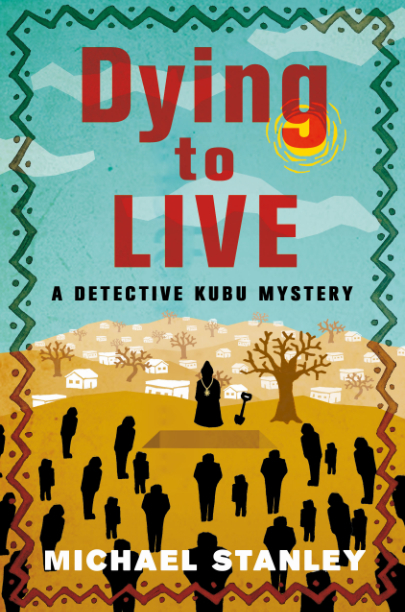 As for Michael Stanley, two days ago we launched our sixth Detective Kubu book Dying to Live. Each of our books has followed a slightly different path. The first was pure pantsing, and we did everything together - writing, research, learning the craft. The second book we outlined and stuck to the outline pretty well. It worked, and we felt we had found the successful formula for efficiently writing books. Until the third book. 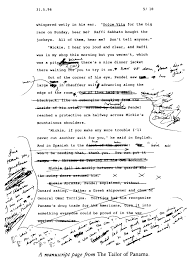 We wrote the outline, but found it didn't work when we actually wrote the book. We shrugged it off, gave the characters their heads after that, and they galloped through the book - except we didn't know how it ended. Till we did. And so on. Now we expect each book to have something of its own writing style. We like being surprised as much as the readers do! All the panelists seemed to be pretty happy with their collaborations (although Reed mentioned one with Ken Bruen which had not gone so well). It works for us and our readers! Dinner (6:00pm) and discussion (7:00pm).